The New Canaan Ram Football Association is designed to keep our football family involved in the program year-round. 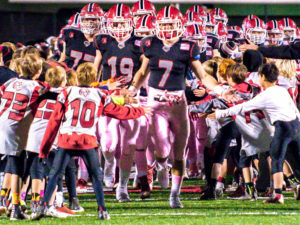 We integrate current players, parents, alums and youth families at events and games to preserve and perpetuate the traditions of New Canaan football. Each season the New Canaan Ram Football Association works with the coaching staff and athletic administration to identify and support the needs of the current program. The organization covers the salaries for football coaches at all levels, varsity through freshman and also awards three-five scholarships to graduating seniors selected by the coaching staff based on financial need. In addition, the NC Rams Football Association supplements the football program for seasonal needs not covered by the Board of Education. These expenses include technology, coaches’ training and resources, players’ scholarships for camps, and equipment needs. NCRFA since its inception in 2007 has donated $225,000 to the All Sports Booster Club for coaches’ salaries, provided $100,000 in scholarships to outgoing seniors (players, managers, and cheer leaders), $5000 to fields, $19,000 equipment and $24,000 in technology. 2017 NC Rams Alumni Association golf outing. The primary event for achieving these goals is the annual golf outing. 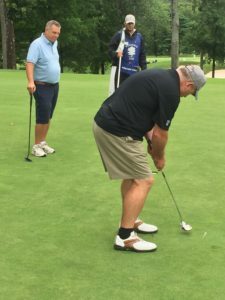 Designed to unite alumni, parents and coaches for a fun day of golf and an evening dinner, the event’s proceeds support the above initiatives, crucial to the success of our program. We invite all New Canaan Football families, players, alums and parents to participate and help us reach our goal to maintain this amazing football experience for our current players and future generations.